Speyburn is located in the small Speyside town of Rothes near the banks of the mighty river Spey. The distillery was built in 1897 on a hill known locally as the Gibbet which is the old Scots name for the gallows where criminals caught their last view of the scenery. Founded in 1698, the cellars of Berry Bros. & Rudd have been, for centuries, a temporary resting place not only for the very finest wines but also for some quite exquisite spirits. Perhaps lesser known, our range of spirits has been expanding year on year, and exponentially since we first introduced Berrys’Own Spirits in 2003. As have the accolades and awards that our spirits team have received in recognition of their expert and passionate product sourcing and blending. In all we do, Berry’s strives to provide unparalleled quality and service. To ensure we achieve these aims we source only from people we ourselves trust. These ideals were perhaps never more in evidence than in the selection of The Berrys’ Selected Spirits. 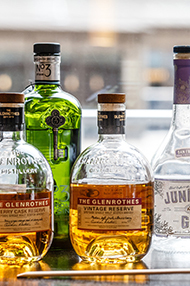 Carefully chosen and blended by our spirits team, led by DouglasMcIvor, they represent the standard-bearers of style and quality from four classic spirits producing regions. 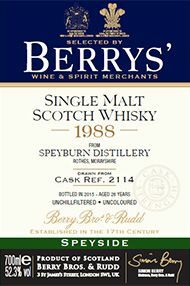 The Selected By Berrys' range comprises two blended Malts from Speyside and Islay, the most popular regions of Scotland, an XO Cognac and a golden Caribbean Rum. Each selection is endorsed personally by Simon Berry and is the perfect introduction to the world of Berrys' spirits.